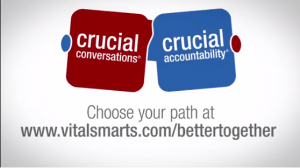 CrucialSkills Leadership Center Sdn Bhd (CLC) is training and consulting company specializing in organizational leadership, behavioral science and dialogue skills, and now the exclusive licensee for VitalSmarts USA in Malaysia and Brunei Darussalam. CLC was established to enable better focus and solution execution to clients with a dedicated team in place. CLC represent VitalSmarts in Malaysia and Brunei with award-winning training product which acknowledges significant results using a proven method for driving rapid, maintainable and quantifiable change in practices. CLC provide Public Workshop, In-House Training and Trainer Certification for organizations to dialogue safely, achieve universal accountability, and influence behavioral change for both others and you. Our programs are jointly organized with Leadership Resources (Malaysia) Sdn Bhd as authorized training partners. CLC also possess employee accountability training which teaches step-by-step processes for enhancing accountability, improving performance and ensuring execution. As a vision to transform lives people to achieve new levels of performance and enhanced relationship through behavioral change, CLC provide the behavioral science training course under the Influencer Training in which a proven strategies to lead behavior change. Drawing from the skills of many of the world’s best change agents and combining them with five decade of social-science research, this course offers a powerful model for behavior change whether you manage a team of ten or ten thousand.